Root crops are among the easiest vegetables to grow, and often the first and last vegetables in the garden to mature. Your garden may produce enough vegetables to take you through the entire year and, if kept correctly, root crops will last a long time in storage. These vegetables are great to grow, even in a small space. 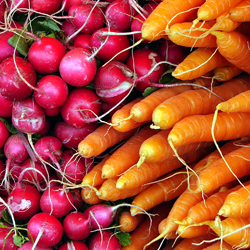 Many root crops are frost tolerant and with most, the tops, or greens, are also edible. To get the best harvest of root crops, no matter which types you opt to add to your garden, you need to meet their cultivation needs. Root crops grow best in deep, loose, rock-free soil that will allow the roots to form and grow easily. To nourish the plants, supplement the soil with plenty of organic matter. Root crops require a high phosphorus fertilizer for optimum growth, but check the needs of individual crop types to choose the best mixture. Always apply fertilizer according to the proper directions to prevent burning. Most root crops are considered cool season vegetables and are planted both early and late in the growing season. Warm days and cool nights are most beneficial for root expansion. Seeds should be sown 2-3 weeks before the last expected frost date and subsequent plantings made every three weeks thereafter as weather permits (some exceptions apply). Planting depth varies depending on the type of plant; follow the directions on the seed packet. After seedlings emerge, thin to desired spacing as determined by the diameter of the root at harvest time. Beet and turnip tops that are thinned are edible raw as salad greens or they may be cooked. Root crops are generally not transplantable because they have a tap root. Mulch plants that have already been thinned with salt marsh hay to retain soil moisture and minimize weed growth. Maintaining appropriate cultivation requirements will reduce or eliminate the need for pest control. As with all vegetables, it is important to rotate crops each year. Rotating root crops will discourage root weevils. 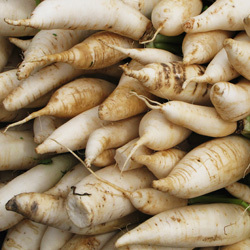 All root crops may be stored for a time before being eaten. In general, store at 32 degrees Fahrenheit and 95 percent humidity. Leave the crops in the garden as long as weather permits, then dig. Store the harvest in a root cellar or refrigerator. Carrots – Plant in sandy soil if you want the classic, long, narrow type. Beets – You may harvest 1/3 of the tops without affecting the root. Garlic – Best planted in the fall. Horseradish – Use caution when planting this aggressive perennial. Kohlrabi – Has a mild, sweet cabbage flavor. Leeks – Flavor is best if harvested after a light frost. Onions & Shallots – Plant from seed or sets. 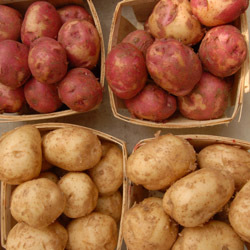 Potatoes – Best planted from ‘seed potatoes’ to match variety. Radishes – Mature in as little as three weeks. Sweet Potatoes – Warm weather root crop, will not withstand a frost. Turnips – For a fall crop, sow seeds in midsummer.